Industry experts predict that successful businesses will soon become 100% digital for all transactions. Sales teams that leverage digital technology close more deals faster, improve the customer experience, and gain clear competitive advantages. Sales professionals are most effective when they’re equipped with the best tools. A mobile-enabled electronic workflow is becoming essential to optimise efficiency and provide teams with true flexibility. 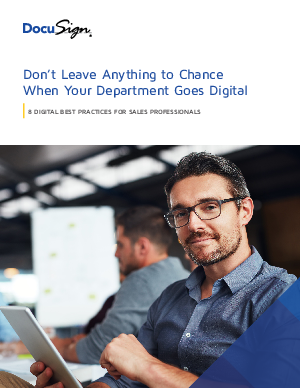 This best practices paper outlines eight important ways that sales teams can make meaningful progress in their digital transformations.